Here’s the third and final installment of my ‘lost’ models (see HERE for the backstory, HERE for the 1970s models, and HERE for the 1980s cars). It startles me that the most recent build on this page (the McLaren at the bottom), was over 20 years ago. 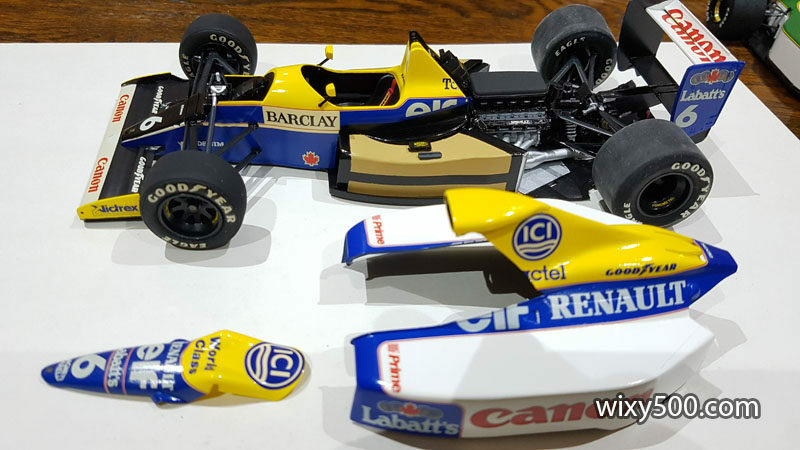 Tamiya 20025 – 1990 Williams FW13B Renault (built as Ricardo Patrese #6). Was really happy with the finish on this one. It was the first time I’d clear coated the bodywork on a model. It’s Tamiya TS-13 straight from the can, with no polishing (I’d never heard of polishing compounds back then!). The blue is all decal, the yellow/white/black TS cans. Tan/kevlar colour of the inner sidepod ducting is hand mixed and brushed. Great colour scheme. 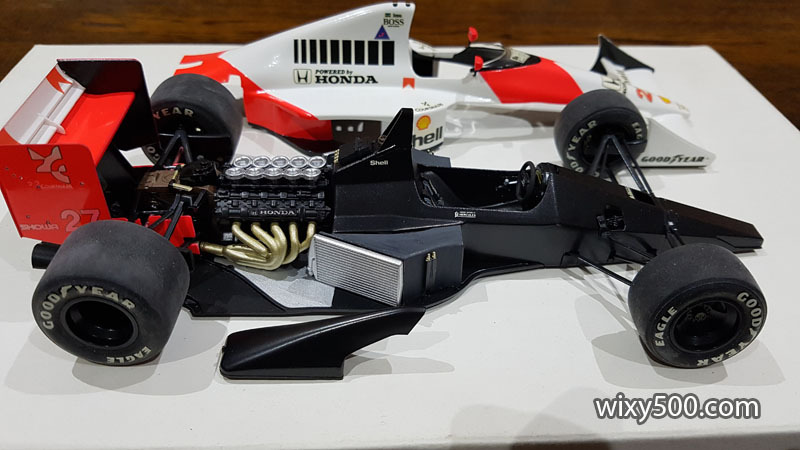 Tamiya 20026 – 1990 McLaren MP4/5 Honda (built as Ayrton Senna #27). A straightforward build using fluro red paint instead of the kit decals. For some reason the red has bled into the white of the rear wing endplate decals. From memory it happened after the clear coat. I have no idea why. 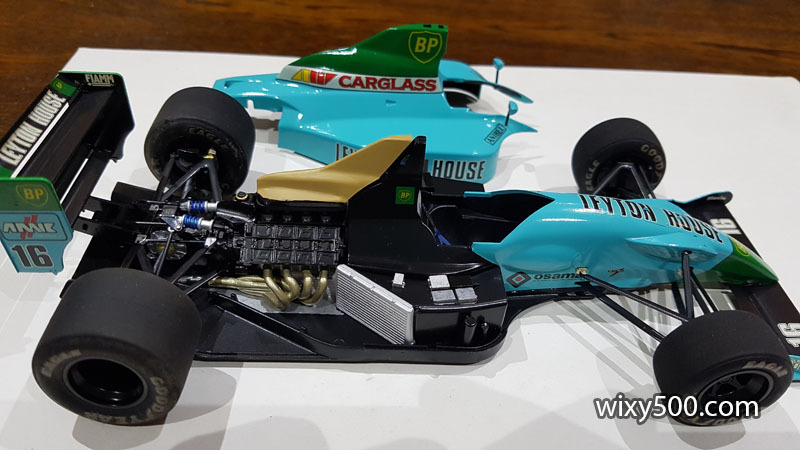 Tamiya 20028 – 1990 Leyton House CG901B Judd (built as Ivan Capelli #16). Great aero shape to this Adrian Newey design, and the interesting colour stands out in the display cabinet. Green on the nose and airbox is decal, but no clear coat. Aftermarket carbon fibre decals could have set this one off really well, but I don’t think they existed back then. 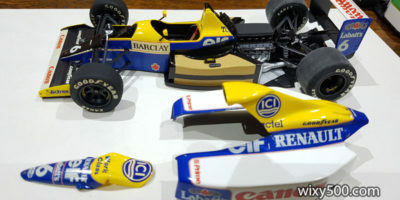 Tamiya 20029 – 1991 Tyrrell 020 Honda (built as Stefano Modena #4). The first real ‘high-nose’ F1 car. All the white areas are done with the kit’s decals. They were too translucent when new and, along with the yellowing over time, give a very poor look now. Body was painted as per instructions (Tamiya TS Gun Metal, from the can), but it’s not quite right as the real car had a bit more of a brownish look to it. Instead of using paint for the heat shield on the floor of the engine bay, I used bare metal foil for the first time. The reflective finish is clear to see. 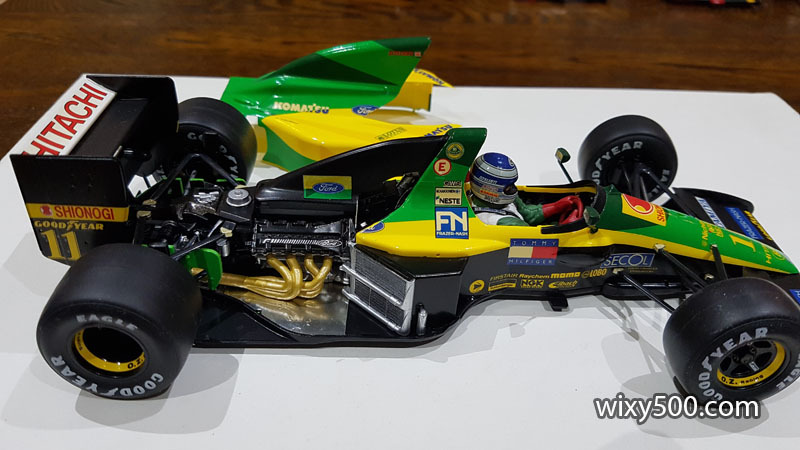 Tamiya 20030 – 1991 Lotus 102B Judd (built as Julian Bailey #12). 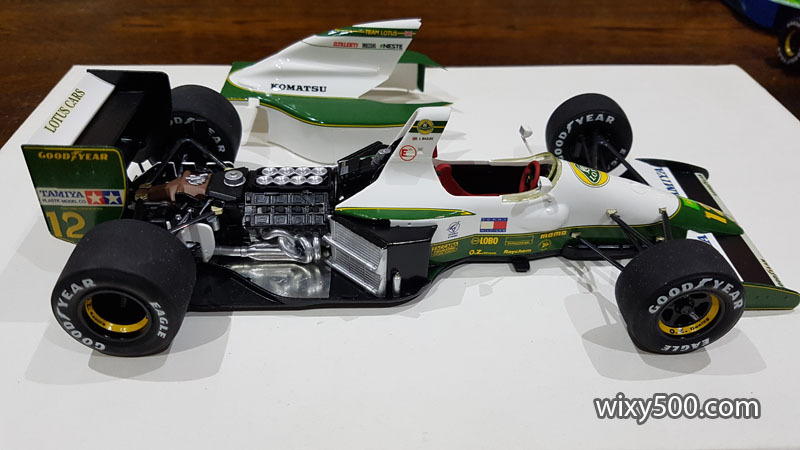 If it wasn’t for Tamiya sponsoring the team, I’m pretty sure a scale model kit of this car (and several other early ’90s Lotus F1s) would never have been produced as it was no great performer. There appears to be very little deterioration of the body or tyre decals on this one, so still looks as sharp as when new. As usual, TS cans and kit decals for the body, foil on the floor and brush for everything else. 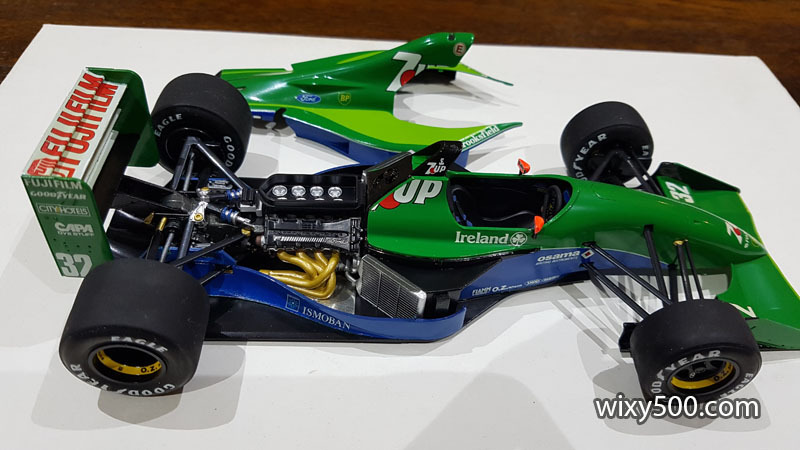 Tamiya 20032 – 1991 Jordan 191 Ford (built as Bertrand Gachot #32). Another shapely favourite of mine and an appealing colour scheme. The green is not a Tamiya colour (Gunze, maybe? Can’t remember the brand, but I do recall it was sprayed straight from the can). Tamiya was now supplying “glossy” decals in their kits, so I didn’t bother with a clear coat. The kit came together well, but it’s a real pain to fit and remove that engine cover. 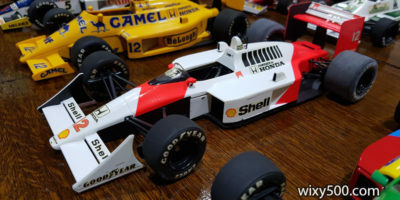 Tamiya 20035 – 1992 McLaren MP4/7 Honda (Ayrton Senna #1). Of these 20-odd ‘lost’ models, this was the most recent build, completed around 1998ish. 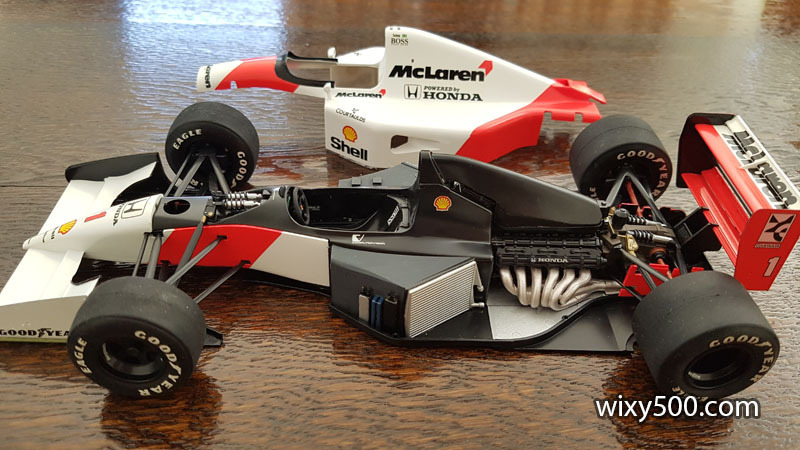 It was a standard out-of-box build, but unlike the other McLarens, this time I decided to use the kit decals for the fluro red areas as they were quite glossy. A small amount of TS-36 was applied by brush around panel edges etc so there were no white bits showing through when the bodywork was fitted. The model still displays well, but close inspection reveals a couple of small wrinkles and cracks on a few of the decals. But considering it’s over 20 years old and there’s no clear coat for protection, that’s probably not too bad. 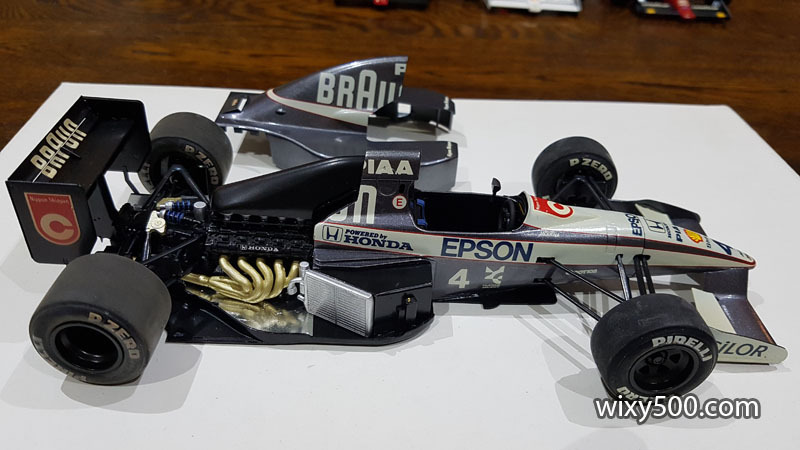 Build diaries of Tamiya kits beyond those in the ‘lost’ list are HERE.